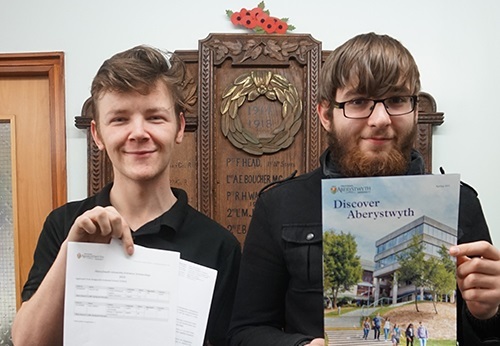 Well done to two of our Year 13 students, Nathan Jones and Joel Clayton, who have received Scholarship Merit Awards from Aberystwyth University, to help fund their first-year studies. To apply, they needed to sit two one-and-a-half hour papers from the choice of subjects on offer at the university. The exams, which were invigilated by the school, are set and marked by the university’s academic departments, and are of a similar standard to A Levels. Nathan, who is Head Boy at Bridgnorth Endowed, is currently taking A Levels in chemistry, biology and English, and has a special interest in conservation, which he aims to go on to study later this year. Joel is studying English, history and psychology A Levels and hopes to do a degree in English Language and Creative Writing. The two Bridgnorth Endowed School sixth formers will be sitting their exams in less than six weeks’ time, with plans to start at Aberystwyth University this September. Good luck to Nathan and Joel! Next PostNext Review: High School Musical on Stage!